This event was hosted by the CDÉNÉ in partnership with the Clare Chamber of Commerce, Argyle Chamber of Commerce and Université Sainte-Anne. Ekphrasis Studio, Church Point, Nova Scotia. 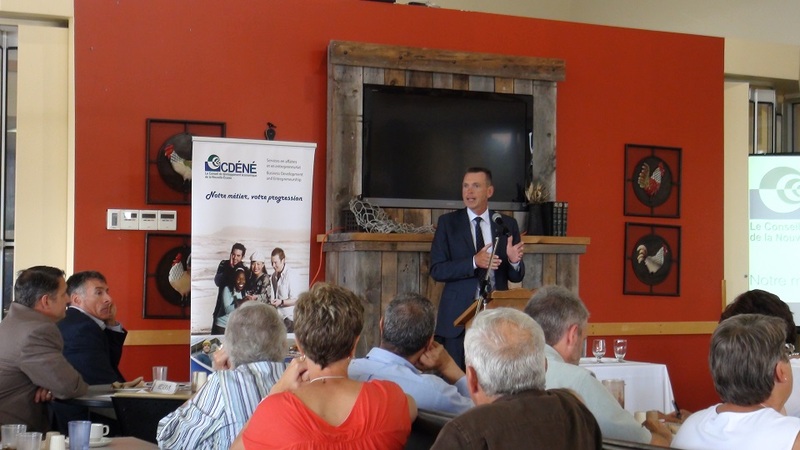 On August 26, Ray Ivany spoke in the cafeteria of University Sainte-Anne during a lunch organized by the CDÉNÉ, which was attended by entrepreneurs, local governments, residents and others from the region. The discussion was in relation to the 2014 Ivany Report “Now or Never”, and aside from addressing specific examples and figures, points of his discussion involved revealing the human mentality in general, and the Nova Scotia mentality in particular. Ivany began by noting that there is a common tendency among people when faced with a problem, to deny an issue exists, or to lie to themselves. He stressed that to move forward we must talk with honesty about our reality. The honest facts of the situation in Nova Scotia are around a 5% decline in population and up to 20% decrease in labour. These have left us with the lowest GDP in Canada. If the demographics speak for the future, the current demography of Nova Scotia does not show much success in store. He insists there is still time to create success, and if success is achieved, those communities who were catalysts will be the ones to profit most. He also noted that there exist 2 distinct realities common in every community in the province. The first reality, is that every community has examples of great businesses, which are paired with a great location, resource, and existing population. Within this reality, these businesses exist because an entrepreneur recognized a desirable location and wanted to live there. The other reality in every community is that regardless of whether there is an economy or not, we feel to be entitled to the best healthcare, schools, roads and infrastructure. This realty prevails because this is in fact how the province has been operating, as though the economy of the region is irrelevant and the elected officials will keep bringing bags of cash from the federal government in Ottawa, or the provincial government in Halifax. But what happens if/when that bag of government cash doesn’t show up?! Transitioning back from a metaphor on tools, Ivany stated we must use new methods of solving and fixing, as our old tools, good as they may have once been, are no longer relevant or effective for the task ahead. He noted that the business-facing functions of the government could be enhanced to work closer to the speed of business, rather at the speed of government, and the need of quickly finding solutions and solving problems. Referencing the fork in the road dilemma, Ivany noted that too often in Nova Scotia the decision of which way to go has resulted in “stop, fight and don’t go anywhere.” The product of such actions essentially blocks any new ideas at Phase 1. A major positive he sees in the 16 months since the Ivany Report’s release, is that people are still talking about it. However, he sees there is a lack of urgency in responding to the report’s findings and recommendations, as though we are waiting to see if things might just work out on their own. Ultimately, Ivany’s message is one of more people, more businesses, more wealth, and that we should be comfortable with our own success, as well as the success of our neighbours. He says he’s agnostic to business, and that wealth creation is achieved through cooperation. Following the talk was a brief round of questions and networking. (Lunch was buffet soup & sandwiches, and sweets). Ekphrasis Studio is a non-profit arts management & creative industries consultancy organization, who co-authored the book Heritage for development in South-East Europe (2014) and have conducted many other artistic activities in Canada and Europe, including ShareCulture!TV citizen journalism for culture. Upon reflecting, we do notice many similarities similarities between Nova Scotia and Albania, please feel free to read more, and stay tuned for upcoming articles!